How’s the quality and does your roller chain meet ANSI B29.1 specifications? Yes! In fact, all of our roller chain meets and exceeds ANSI specifications. Our metric roller chain meets and exceeds ISO 606, BS 228 and DIN 8187 standards. All products are manufactured in an ISO 9001:2008 factory for quality assurance. Is your chain pricing by the foot? No. The pricing reflects the roll/reel size. Can I buy the individual chain components such as the plates, pins or rollers? No, we do not sell chain components. How do I know which sprocket fits my chain or vice versa? Its pretty simple! Look at what number is stamped on the side of the chain. You might see a number like 25, 35, 40, 50.... When shopping for sprockets, just look for the matching size. Example: A #40 chain will fit any number #40 sprocket. How do I find out what size chain I have? You'll need to measure the roller chain. Click here for a listing of roller chain charts and dimensions. Be sure to measure all reference points shown in the roller chain chart! Yes! Most of our products are in stock. Our product availability is shown in the categories and product pages. (Sample Shown Below) If we do not have enough in stock, then give us a call at 800-982-3141. New inventory arrives weekly. Do you offer custom made to order products? Absolutely! This is large part of our business. We offer custom made to order sprockets, attachment roller chain and much more. Click here to send us an inquiry. How soon will my orders ship? Most orders are shipped within 1 business day. Excludes holidays. to view our Holiday schedule. *UPS is also closed these days. Deliveries will not be made. Need a shipment before the holiday? Call us at 800-982-3141 to see which shipping service you need. Yes! You’ll receive a shipping confirmation when the order is shipped. The tracking number may not register on the carrier’s website until the evening hours or the next day. Most customers receive their order within 2-5 business days from the ship date. Excluding Weekends & Holidays! We do offer UPS Next Day Air and UPS 2nd Day Air for customers who need their order by a certain day (Excluding Weekends). Can I call an order in? Yes! However, we strongly encourage the order to be placed online. We do not accept responsibility for errors made on phone orders. Yes! When you’re logged in under “MY ACCOUNT” you’ll see a section labeled “Track Your Recent Orders”, which will show the current status of your order. Can I change, cancel or add to my order after I submit the order? Sorry, but we do NOT allow the order to be canceled, changed, added to, or combined with another order once the order has printed in the warehouse. Verify the products and quantities before submitting the order. Can I return items if I ordered incorrectly? Yes, click here for our return policy and procedure. Can I reference a PO or Work Order number? Yes! In the checkout, we have a field labeled “Do you need to reference a PO or Job number” where you can enter this reference number. This reference number will be on the packing slip and the shipping label. Why is sales tax on my order? Due to a new Federal court ruling, states can now require remote sellers to start collecting and remitting sales tax. My company is tax exempt for the products I purchase from you - How do I get on tax exempt status for my orders? We ship orders via UPS. Large truck freight orders are shipped by R&L Carriers. Will my order ship with signature required? No, we do not ship orders out where a signature is required. However, UPS has their own policies and they may require a signature for various reasons (i.e. Areas with high package theft). Can I bill my own UPS account number? Yes! Enter the account number in the comment section of the checkout page. Please specify if its a collect or 3rd party account. 3rd Party Account Billing: Make sure to include the 3rd party account name and address. This will prevent significant delays. Orders are held until the account is verified with UPS. Your credit card is only “authorized” (Not charged), when the order is submitted, so when the order ships the credit card will only be charged for the products. Some orders may ship from more than one warehouse if we can not fulfill your order from any single warehouse. In the event this does happen, then your account will be billed for each shipment being made. This is not common but it does happen. We accept Visa, MasterCard, Discover and American Express. Payments are processed through authorize.net on our safe and secure website. You can verify below that we’re a verified merchant through authorize.net. How does the charge appear on my bank account? Do you offer open accounts? Yes! You’ll need to fill out a credit application to see if you qualify for an open account. However, we do require the first order to be placed with a credit card to establish an account with us. Click here to download the credit app. Absolutely! We keep your personal information private and secure. Our secure servers protect your information using advanced encryption techniques and firewall technology. Do you flood my inbox with promotional or marketing emails? No! We only send promotional emails to customers that are signed up for our newsletter. It’s not very often that we send promotional/marketing emails, so don’t be afraid to signup to our newsletter for an occasional email. No worries! You can reset your password by clicking the “MY ACCOUNT” tab, then enter your email address and finally click ‘Reset My Password’. A link will be sent to your email that will allow you to enter a new password. The link sent to your email will be valid for 10 minutes for security reasons. We have multiple employees that order. Can I create multiple logins for my account? No, you can only use email address for a login. We recommend using a generic email everyone can use such as [email protected] or [email protected] Just DON'T use a password that reflects a password you use for other stuff. How do I change my email, address and password? Simple! 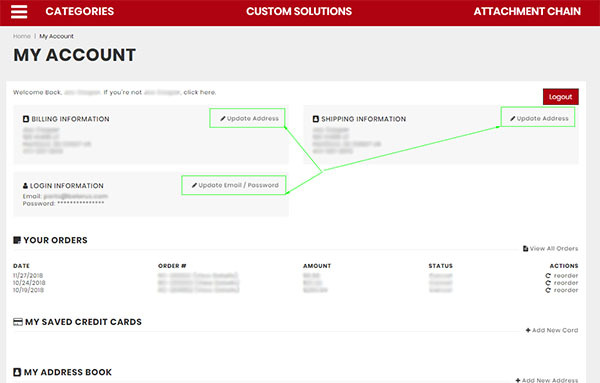 Log into your account under the “MY ACCOUNT” page, then click on “Update Address / Email / Password” shown in the green boxes below. Sample picture below. Didn't answer your question(s)? Send us a quick message here.